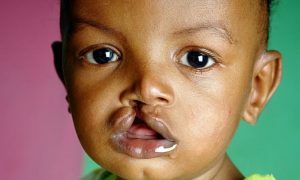 Scientists and healthcare specialists alike are still puzzled on the exact causes of facial clefts. However, there seems to be some slight breakthrough or what appears to be a step towards identifying the right cause of facial clefts. Of late, researchers that are dedicated on understanding the main causes of clefts have come out to argue that a handful of genetic mutations are linked to facial defects. In a recent study, researchers studied DNA samples from 184 people from Philippines and Iowa that had cleft palates and cleft lips and went ahead to compare it to the DNA of those people without this condition. The researchers found seven types of mutations related to genes that are associated with the onset of fetal facial development. According to these researchers, gene mutations may contribute for about 5% of palate and cleft lip cases that are completely not associated with birth defects or other syndromes. Apart from gene mutations that occur during pregnancy where mutated genes get passed down from parents to children, other possible causes of clefts include not getting sufficient folic acid during pregnancy period, using certain types of medicines during pregnancy, having certain types of infection during pregnancy, and smoking or engaging in heavy drinking during pregnancy. Apart from genes, the above are widely believed to be some of the contributing causes of clefts, and pregnant mothers are always encouraged to ask their medical providers on the types of medicines or foods to consume to cut the risk of cleft development. 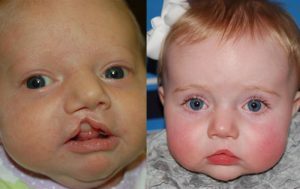 Besides the causes, there is a surgical procedure of repairing clefts, and we at Wide Smiles have experienced surgeons well experienced in this area who will make cleft repair of your child an easy process than you think. 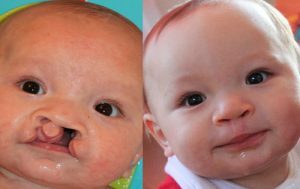 Cleft repair is through a surgery that involves the process of joining the tissues that did not manage to do so while your child was developing in the womb. Of importance to note is that the specifics of the surgical procedure may vary, but we at Wide Smiles employ the latest industry procedures, and with us, rest assured that your kid is in the right hands. 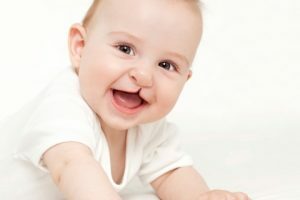 Normally, cleft lip repair is carried out when your kid is three years old, and during this time, surgery will be carried out when the baby is asleep all the time. Once your kid is fast asleep, a small tube will have to be passed into the airway to assist the baby with breathing, and another thin tube known as a cannula will be inserted into a vein, main in the child’s foot for purposes of passing fluids to the baby during the process of surgery and immediately after in case it is necessary. After the process is complete, some bleeding is expected, and if you are keen, you may notice some stitches, crusting, and some small swelling on your child’s lip. We at Wide Smiles may have to place a small piece of foam to hold the reconstructed tissues into place in addition to placing splints on your child’s arms to avoid him or her interfering with the stitches. 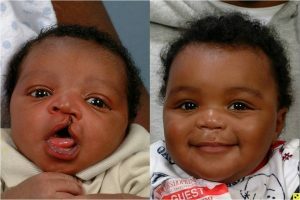 After one to two hours, your child’s lip will look perfect and ready to begin the healing process.